Mercury and Venus orbit between the Sun and Earth and so the planets appear as a partial disc - similar to phases of the Moon (but never the full disc like the full Moon). As the Sun travels across the sky, Mercury and Venus travel ‘with’ the Sun. This means that Mercury and Venus are seen around the time of dawn or dusk. When the Sun is high in the sky, its brightness means the two planets are not visible. I took the photograph below in the evening and you can pick out Venus as a very bright object, but Mercury is barely visible with the naked eye. Notice there is a clear, far western horizon, with no hills, trees or buildings in the way. Greatest Elongation means the point in the orbit where the planet is at its furthest angle from the Sun. Although there are other times of the year when this event occurs, the positions of the Earth and Sun relative to Mercury are not always favourable. Usually there is one really good pre-dawn viewing period and one really good viewing period after sunset each year. Mercury will be highest above the horizon on the two dates shown, but the planet may be seen nearer to the horizon for a week before and after each date shown. Observe from a point where you can see the horizon with no obstructions in the way. SAFETY ADVISORY - NEVER EVER LOOK FOR MERCURY IF THE SUN IS IN THE SKY. ALL THE DETAILS MENTIONED REQUIRE THE SUN TO BE BELOW THE HORIZON LINE. Around an hour before sunrise or 30 minutes after sunset is the time to go out with a pair of binoculars. Stand and hold your outstretched arm with your thumb up and your finger lined up on the horizon as shown above. 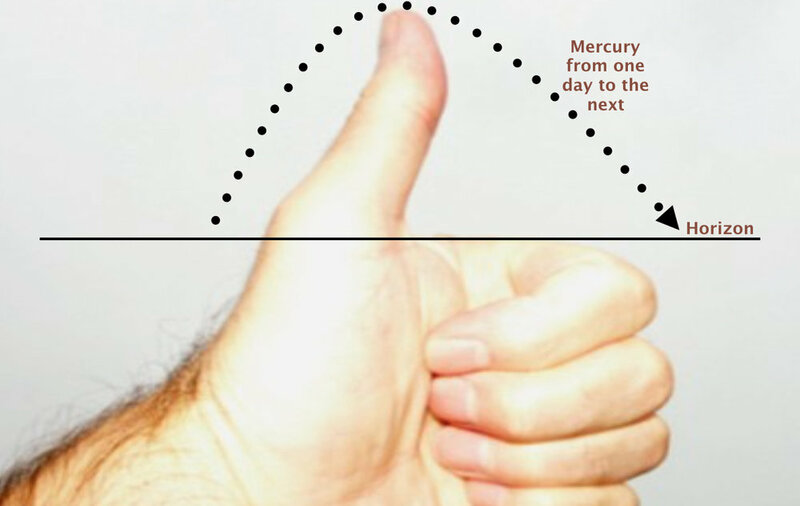 Mercury will never rise above the tip of your thumb - so the area near to the horizon that you have to search is relatively small. Focus your binoculars on a distant object and then scan the sky left and then right near to the horizon. Mercury is very faint and if you have never seen the planet before you might take a while to spot it. Be patient. Maybe Mercury has not risen above the horizon as much in the predawn sky - so give it 5 minutes and then try again. Maybe the light from the Sun is still too bright at sunset - so give it 5 minutes for the Sun to go down some more. When you see Mercury for the first time, like me, you may call out and think why did I miss that! When Mercury appears in your binocular view, take the binoculars away and see if you can spot the planet with your naked eye - it will be very faint. Look again in steady binoculars (rest them against a tree or other solid object) and see if you can detect the phase and the size of the planet. Then, if you view on following days, note how the phase and the size of Mercury changes. The dots in the image above show how the position of Mercury varies in relation to the horizon day by day. You will already have seen Venus around dawn or around sunset - it is so bright that you cannot miss it! There are many opportunities to see Venus around dawn and dusk each year as it orbits further from the Sun than Mercury. Venus reflects a great deal of sunlight and is incredibly bright at times. Venus can be seen well before sunset, appearing before all other stars and planets. Also, Venus remains clearly in view well after the Sun has risen above the horizon. There is no need for a clear, low horizon as Venus rises much higher in the sky than Mercury. SAFETY ADVISORY - NEVER EVER LOOK AT VENUS IF THE SUN IS NEARBY IN THE SKY (JUST A FRACTION OF A SECOND OF SUNLIGHT INTO YOUR EYE THROUGH YOUR BINOCULARS CAN DESTROY LIGHT SENSORY CELLS IN THE RETINA PERMANENTLY). IF TAKING YOUNGSTERS OUT TO VIEW, ALWAYS BE IN CONTROL OF THE OPTICAL INSTRUMENT - NEVER TURN YOUR BACK! As with Mercury, have a look at Venus over a period of time (Venus remains clearly in view for weeks at a time). Check the phase and size of Venus. This is much easier than for Mercury and you really can see the size of the planet increasing in your eyepieces as the planet moves towards us in its orbit - or getting smaller as it moves further away.